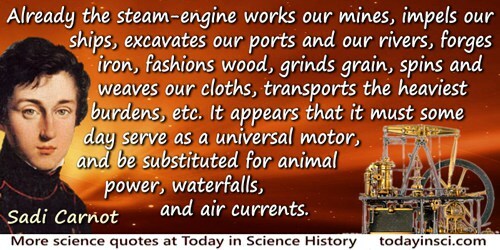 French engineer and physicist who spent much of his life investigating the design of steam engines. 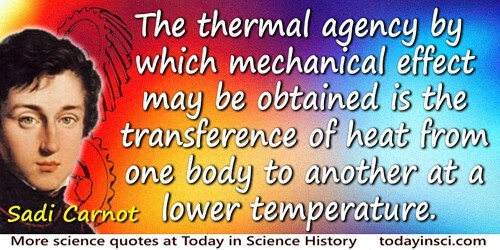 His work led to the development of thermodynamics. 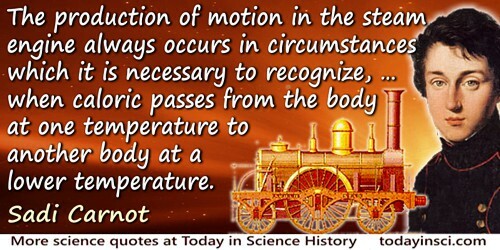 The production of motion in the steam engine always occurs in circumstances which it is necessary to recognize, namely when the equilibrium of caloric is restored, or (to express this differently) when caloric passes from the body at one temperature to another body at a lower temperature. 'Réflexions sur la Puissance Motrice du Feu et sur les Machines Propres a Développer cette Puissance' (1824). Trans. Robert Fox, Reflexions on the Motive Power of Fire (1986), 64. War and the steam engine joined forces and forged what was to become one of the most delicate of concepts. Sadi Carnot … formed the opinion that one cause of France’s defeat had been her industrial inferiority. 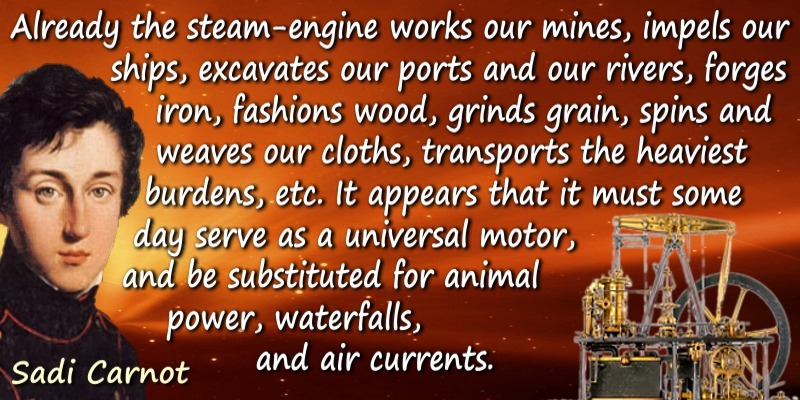 … Carnot saw steam power as a universal motor. … Carnot was a visionary and sharp analyst of what was needed to improve the steam engine. … Carnot’s work … laid the foundations of [thermodynamics]. In The Second Law (1984), 1-2. 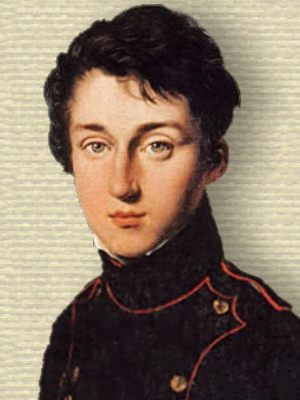 1 Jun - short biography, births, deaths and events on date of Carnot's birth. Reflections on the Motive Power of Fire, by Sadi Carnot. - book suggestion.